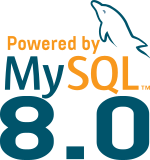 MySQL Group Replication is just one component of the upcoming MySQL HA Solution as Matt Lord explained it in his GR quick start guide. So while mysql-router is back to school to become smarter and learn how to take the right decision we can already use existing 3rd party solutions. To be honest, if people are already using a load balancer/proxy with MySQL asynchronous, semi-sync or other virtual synchronous solution and want to evaluate and migrate to MySQL’s native Group Replication, they might not migrate load balancer at the same time as they move to GR. Step-by-step migration, one component at the time is always recommended in complex architecture. So in this post, I want to cover HAProxy and a dedicated health check related to what might be the more common architecture. Matt already explained in his start guide how to use GR with HA. He also provided and healthcheck scripts and a HAProxy configuration when using only one member (recommended for WRITEs) and the other ones stay as backup. What is then that most common architecture ? So due to the GR limitations (DDL, FK, …) it is recommended to send the WRITEs to one node (unless you really know your workload and what you are doing). For the READs, we can use any of the group members (unless they still have a large queue to process). Usually people use then 2 different ports, one to send the WRITEs and one to send the READs. Of course the application should be able to define which type of query is needed and use the right connection (db handler). So HAProxy is listening on :3307 to handle all writes and send them only on one dedicated member. Failover for writes will happen only is MySQL has a problem or becomes read-only. 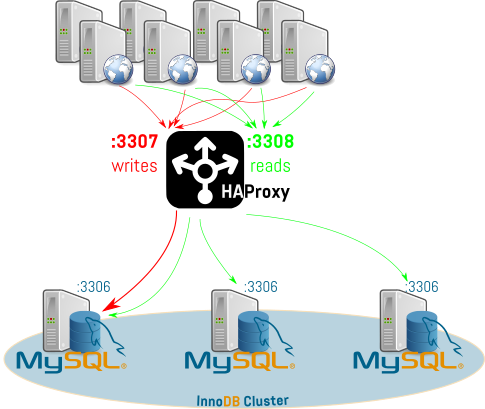 Reads are sent to port :3308 and HAProxy will round-robin those reads to all members of the group. We will then setup 2 different xinetd services to check the status of the MySQL Group Member and decide if the node can be used for reads and or writes. Group Replication member is a viable routing candidate for write. Group Replication member is a viable routing candidate for read.